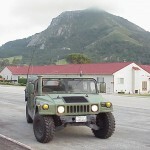 M998-series 1.25-ton 4×4 “humvee” trucks. Time for a HMMWV Make-Over? I have a HMMWV. It’s a 1986 USMC M998 that I bought back in December of 1999. It was stripped of all accessories when I got it, and it had some mechanical issues to work out, but I fixed it up into a well-running truck… and it only stranded me 250 miles from home once! 🙂 This is my rambling post in which I consider whether and how to reconfigure my truck again. This is my second ex-military truck. It’s an M998 High-Mobility Multipurpose Wheeled Vehicle, commonly called a HMMWV (pronounced “humvee”).